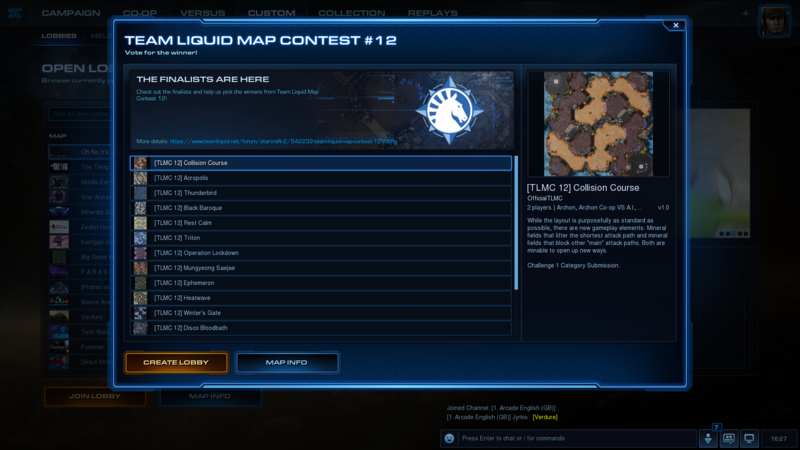 With this announcement, Team Liquid Map Contest #12 has officially come to an end. Below you'll find the most popular maps according to you, our community. The voting this year was as close as ever and the community was split, not a single map went without getting 5 points from at least a few top votes.You'll find the results below but keep in mind that the winner here isn't necessarily guaranteed a spot on the ladder, that is up to Blizzard in the end. Now, without further ado, here are your top 5! Judge's comments: AVEXI’m glad to see that we have our first Challenge/New map in the TLMC12 since Neon Violet Square be Winter’s Gate by Marras. As her second map in the Top 5, Winter’s Gate is a very fantastic execution of the new Inhibitor Zone Generators, placing them next to rocks, and obscuring the direct pathways through the center until said rocks are destroyed. These zones will immediately affect the play of the map, encouraging armies to avoid the center and skirmish in different locations, or take risks with the new zones. Players who are also not a fan of drops might be fans of this map as well, with Zones slowing air units by the corners of the main bases. This was the best performing Challenge map in the judgement process, and it’s good to see that the voterbase agrees. Judge's comments: KantuWinter’s Gate by Marras was one of the most preferred maps of Challenge 2 by certain Judges, and surely it is good to see that it is one of the most preferred maps by the broader community as well! Winter’s Gate with its slowing zones near the third will surely bring some headaches to defensive players, yet that’s exactly what makes it a valuable map, the fact that slowing zones are used in a highly interactive position with players armies makes for some very potentially interesting situations. Judge's comments: AVEXThemusic246 returns once again to TLMC with a solid standard map execution. This layout has actually become relatively popular amongst mapmakers, and I would believe this map to be one of the best executions of said style, even sprinkling influence from other maps such as Abyssal Reef along the side pathways. Triton is definitely a show, and not tell style of a map, where there isn’t too much to speak of in its uniqueness, but rather just a strong showing and execution that should be a solid example for newer, aspiring mapmakers. Judge's comments: KantuTriton crafted by TheMusic246, submitted to the Standard category will surely provide players with some very fair matches, the terrain of the map is well crafted so as to add that extra level of interesting attack paths, blockades and battle fields that will surely be enjoyed by many. Judge's comments: AVEXDefinitely one of the aesthetic favorites of many in this TLMC, Marras is continuing the neon light fad in TLMC12 with Disco Bloodbath, incorporating elements from both Blackpink LE and Neon Violet Square LE. I don’t have too much to say on this map, it’s a fairly decent and unique execution of a macro layout, with a strong emphasis on the horizontal expansion pattern. This map is a good example for future Macro Map submissions, noting how safe or easy it is to obtain a third base as opposed to a standard map such as Catalyst. This is the beginning of Marras’ mapmaking career as she shines strongly with Disco Bloobath. Judge's comments: KantuDisco Bloothbath by Marras, just like our first place Acropolis also belongs to the Macro category, sporting a flashy tecno tileset Disco Bloodbath will indeed give players their much desired floor dance fix. That said, the map will certainly provide future ladders with a very solid canvas where players can enjoy some games of StarCraft without too much of that pesky cheese. Judge's comments: AVEXNegativeZero should be no stranger to those who follow the map scene, and Ephemeron was unfortunately knocked out early in the previous TLMC in the extremely competitive Standard category. Fortunately, it came back with a strong showing in the tournament and definitely holds up as a unique execution of the Standard formula, moving away from multiple third options, and balancing itself carefully on the use of large debris and the narrow bridges in the center. It’s also very green, which many players have been asking for, for some time. Judge's comments: KantuEphemeron created by NegativeZero is indeed a very green map, something that players indeed enjoy very much, tho gameplay wise, the map offers a different yet highly evolved take on its general layout and center, map displays a single third, instead of the more widespread 2 optional ones, something that accents the importance of said base. In the center and around the corners the map burrows from Superouman’s bridge ideas to great success, helping accent gameplay through the central highground. Judge's comments: AVEXI’ve been saying it for a while, but RQM is one of the underrated mapmakers in the scene, you all should look into his other work and see the potential he has and this remains true as he now wins two TLMCs back to back, formerly with Automaton, and now Acropolis (perhaps its the A in the name? Hehe.) I heard strong favor towards this map through the tournament, and I’m glad the judges were able to give valuable pre-judging feedback to push this map from being “pretty decent” to a TLMC winner. Acropolis is an example of what it looks like to create a proper Macro execution, where it supports longer games without being exhaustive of its features in supporting that goal. Judge's comments: KantuAcropolis by RQM is a very aesthetically pleasing map inspired by Greek ruins, a custom made tileset which hasn’t been showcased in StarCraft before. Given that it came from the Macro category, the games that were seen in the tournament stage reflected that, with some of the games seeing some big army clashes in the central ruins of the map. 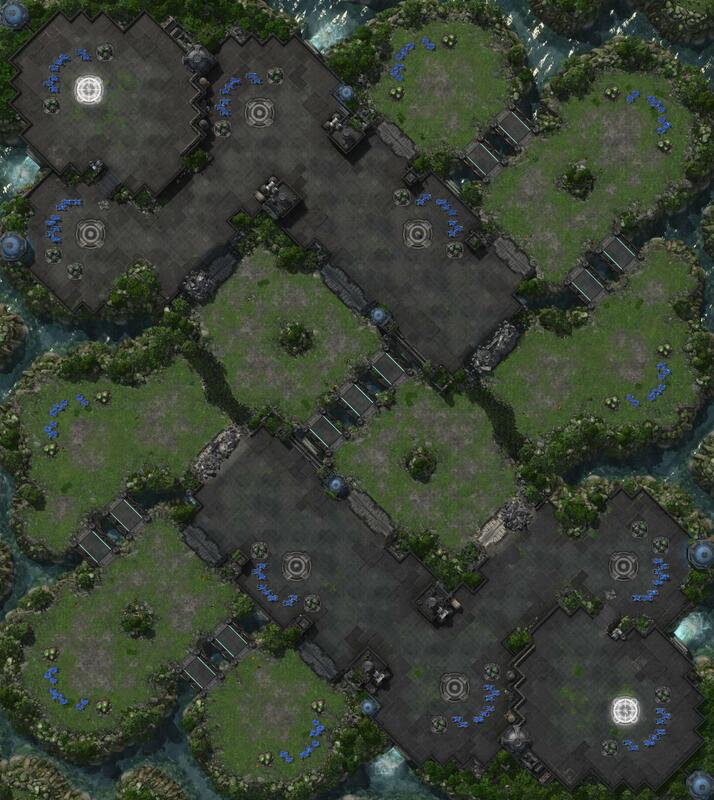 It is our hope that this map provides a solid backbone of action for future WCS tournaments. We, the organizers, want to start off by thanking Blizzard for their continuous involvement in the Team Liquid Map Contest. This year we were featured in the client for the first time and we believe that's a great step for this competition to take. It attracts newer users and our goal is to make the entire StarCraft 2 community happy, not "just" the TLnet community. We also want to thank the mapping community for coming back to us every year. The maps this year were all incredible, in their own way, and we saw some of the prettiest maps to date. Moving forward, we want to make sure you're happy with this competition and will therefore host a quick survey for the map making community, so we know what we still need to work on improving. The survey will go live in about a week and we'll make sure it reaches as many eyes as possible. Last, but definitely not least, we want to thank all the admin staff that has helped out. The pro players and the representatives from the map making community. As I wrote in the Top 16 announcement post: without you none of this would have been possible. See you all again for TLMC #13! Congrats to RQM for that 1st place! We had a nice round of maps, minus a few memes that only had just well. meh games. But GG and well, I got time to sharpen my tools so I am a finalist once more! There were a lot of good maps, standard and more special, a lot of them were worth a vote imo. Wow! Happily surprised to see Acropolis' first place.. Thanks for the likes, sc2 fans. Mapper judges AVEX and Kantu gave me nice feedbacks to upgrade the map and now there are those kind comments from them. Really cheering words! Thank you very much! So there is the Superouman Nat™ in the first place and the Superouman Bridges™ in the second place map. Do I win a chocolate medal or something? Pretty pleased with these results. Looking forward to playing on Acropolis, Ephemeron, and Winter's Gate especially! I want to play on Ephemeron, please no UMS maps on ladder though. Others are fine, but snow tile can be annoying to look at. I wonder which ones will make it to the ladder? Glad Ephemeron made second place – that one was my favorite by far. Haven't seen the games but scrolling through the maps I must say that they look really good. Kudos to all mapmakers and ofc congratulations to the winners! So glad we have so many talented mapmakers in the community. Great job to everyone involve! I'd only have one request for the future TLMC. Would it be possible to have a longer voting period? This week it was quite a struggle to find the time to have a look at all these maps ingame as there simply wasn't much time left in the day - especially with IEM Katowice going on as well. I already know the timeframe was provided by Blizzard and there wasn't much to do about it when last week's voting phase came around. But it'd be great do have a few more days in the future. Yeah. I second that. I didn’t feel like I could vote without watching a good sample of games, but I only was able to catch up on a few of the map tournament VoDs with The IEM Katowice going on. So I ended up not voting. That said, the winning maps all look great and congrats to the winners and thanks to all participants. Didn't notice voting ended already, whoops! Just wanted to say these final 5 maps are pretty sick. Heatwave got robbed, though... and i'm not sure how "fun" slowing fields would be in competitive ladder. Thanks for making these awesome maps and hosting the contest, ladder would be lost without you. congrats! first place map looks nice. We'll definitely keep this in mind in the future. We'll also, hopefully, include direct links to a few games for you to watch on all the maps. It won't always be possible to have a longer voting period but I will definitely prioritize it in scheduling. Congrats to RQM. Automaton is my favorite map currently. I think including links to certain VODs for the maps is a great idea in the future. You could showcase at least one game per map, and include a link in the voting thread as long as it's not too much of a hassle. Many of the maps are excellent, and choosing one over another is becoming more and more difficult for me with each iteration of the competition. I had a really hard time choosing which five I voted for, and would have probably made a more informed vote if I had enough time to watch more of the VODs. Really excited to check out the new slow zone map. 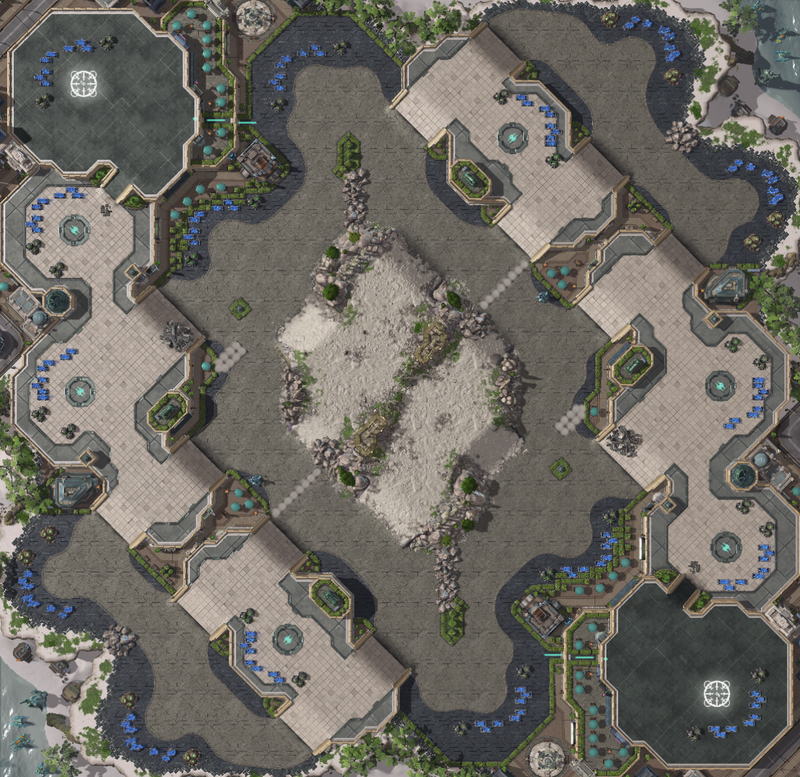 All these maps look like nice incremental improvements to standard play and it's really nice to see the careful evolution of the map pool. Thanks to all the mapmakers for the special care in crafting these maps. It really shows!